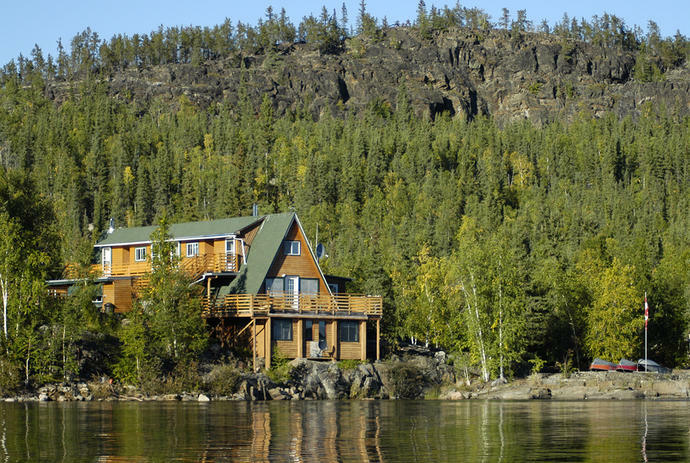 Soar on a scenic float plane ride from Yellowknife into the wilderness of Yellow Dog Lodge, a family-run fishing retreat perched between two pristine lakes. A guide reveals the best fishing spots and you spend the day amid nature with only the sounds of thrashing pike and water lapping the boat. Experience the feisty fight of northern pike at the end of your line. Kayak and spot otters, eagles and black bears. Hike through spruce forest and wildflowers, picking berries and watching for moose. Catch a fresh trout and prepare it over an open fire for a shore lunch with all the fixings, a Canadian tradition. Get to know your hosts and listen to tales of local folklore, history and life in the North. Look up from a roaring campfire and spot eerie Northern Lights dancing across a star-splashed sky. After a soak in the wood-fired hot tub, bed down in your cozy lake-front lodge or cabin to the loons calling.